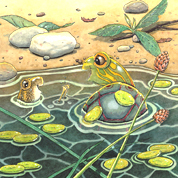 Tudley, a pond-living painted turtle, adopts other animals’ behaviors—simply because he doesn’t know he can’t! 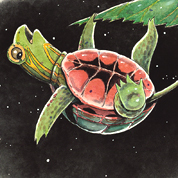 He flies like a bird, sings like a katydid, hops like a frog, and glows like a firefly. All the while, he uses his special behaviors to help other animals. But will Tudley’s new friends help him when he needs help? The “For Creative Minds” education section includes fun facts about painted turtles, rubythroated hummingbirds, fireflies, leopard frogs, and true katydids. It also contains a “Make a Hopping Tudley” craft, a recipe for hummingbird sugar water, a “Creative Sparks” section, and a “Food for Thought” section. This fictional story includes a 3-page For Creative Minds section in the back of the book and a 27-page cross-curricular Teaching Activity Guide online. Tudley Did’'t Know is vetted by experts and designed to encourage parental engagement. Its extensive back matter helps teachers with time-saving lesson ideas, provides extensions for science, math, and social studies units, and uses inquiry-based learning to help build critical thinking skills in young readers. The Spanish translation supports ELL and dual-language programs. The interactive ebook reads aloud in both English and Spanish with word highlighting and audio speed control to promote oral language skills, fluency, pronunciation, text engagement, and reading comprehension. Vetters: Thanks to James White, Associate Director Land & Biodiversity Management of The Delaware Nature Society and Co-author of Amphibians & Reptiles of Delmarva, and to Jim D'Angelo, Director of the Sterling Nature Center for checking the accuracy of the For Creative Minds section. 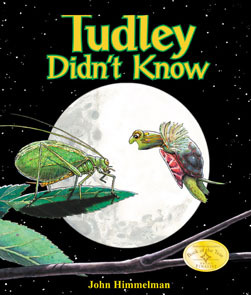 John Himmelman (Tudley Didn't Know) has written and/or illustrated over 60 children's books since 1981. His award-winning book "Pipaluk and the Whales" (published by National Geographic) is based on the true story of how far people will go to save their wild neighbors. John's series of 13 different books (published by Children's Press, a division of Scholastic) includes such titles as: A Monarch Butterfly's Life, A Pillbug's Life, A Luna Moth's Life, and A Woodfrog's, Life. He based his Animal Rescue Club (Harper Collins) beginning reader book on a group of real children who rescued orphaned and injured wildlife. John's first book for adults,Discovering Moths, was recently published by Downeast Books. Most of John's book stem from his obvious passion for animals and nature. When John isn't busy writing or illustrating his books, he is involved with the CT Butterfly Association; the Killingworth Land Conservation Trust leads nature walks and gives natural history lectures throughout the country. 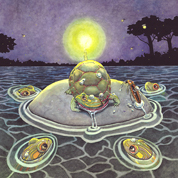 He works with schools by offering special science observation programs, and teaches courses on children's book writing. As if he isn't busy enough, John has two children (one in college and one in high school) and a working wife (high school art teacher) with a busy life of her own. John says he has never lost his love of reading and ends each day curled up in bed with a good book! Visit John’s Website.